FORT WAYNE, INDIANA – Ash Brokerage made its downtown move official Wednesday, June 1, with a ribbon-cutting ceremony inside its hallmark three-story atrium. Invited guests and media were on hand for the occasion, which happened to mark the four-year anniversary of the date CEO Tim Ash originally shared his vision for a new headquarters with employees. Ash Brokerage now occupies the top three levels of the Ash Skyline Plaza, a collaborative project that includes a city-owned parking garage, street-level retail space and a level of leased commercial space. In his remarks, Ash thanked the many people who contributed to the project’s success, including Fort Wayne Mayor Tom Henry and Larry Weigand, CEO of Weigand Construction, who also spoke at the ceremony. “There’s no ‘I’ in this company. It’s a ‘we’ thing,” said Ash. He explained the Skyline Plaza was built first and foremost for the employees of Ash Brokerage, many of whom watched the ceremony from the railings of the atrium’s top floors. It was also for the community, building on the city’s vision of making downtown Fort Wayne a place to live, work and play. “There’s no city in America that’s considered great that doesn’t have a great downtown,” Ash said. Mayor Henry echoed his sentiments, noting Ash Brokerage could have gone anywhere else in the city, the county or even the country. “It had been decades since a headquarters, much less a national headquarters, had made the decision to call downtown Fort Wayne home,” he said. He called Ash Skyline Plaza a “tremendous asset,” that would be a catalyst for future investments downtown and in the entire community, noting the city has already seen snowball effects from the project. Weigand called the building “iconic,” and said it set the stage for future growth in the area. “This is no ordinary building … Every detail, every feature exudes quality, innovation and creativity,” he said. 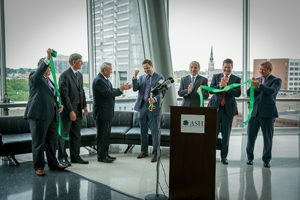 Attendees had the chance to see those details firsthand during guided tours of the Ash Brokerage headquarters following the ribbon-cutting ceremony. With approximately 260 employees currently working there, the space was designed to allow everyone to sit within 50 feet of a window. In addition to the atrium, the space features a dining and recreation area, coffee bars, lounge areas and a myriad of meeting spaces that can accommodate everything from quick conversations to conferences. Following three waves of moves, all of the company’s Fort Wayne employees are now working in the building, located at 888 S. Harrison St.
Two companies, Barnes and Thornburg, and DuCharme, McMillen & Associates, are leasing the commercial space on the sixth level. The firms will move in later this summer.